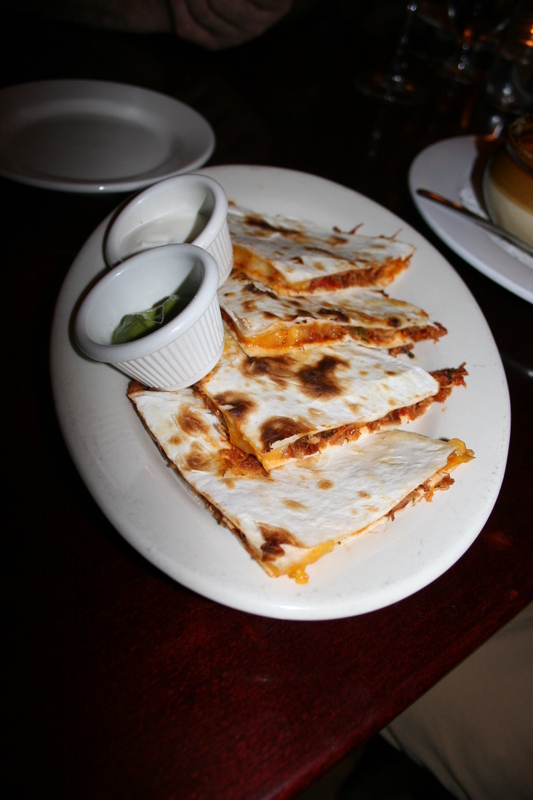 There is something about Casona that appeals to me. 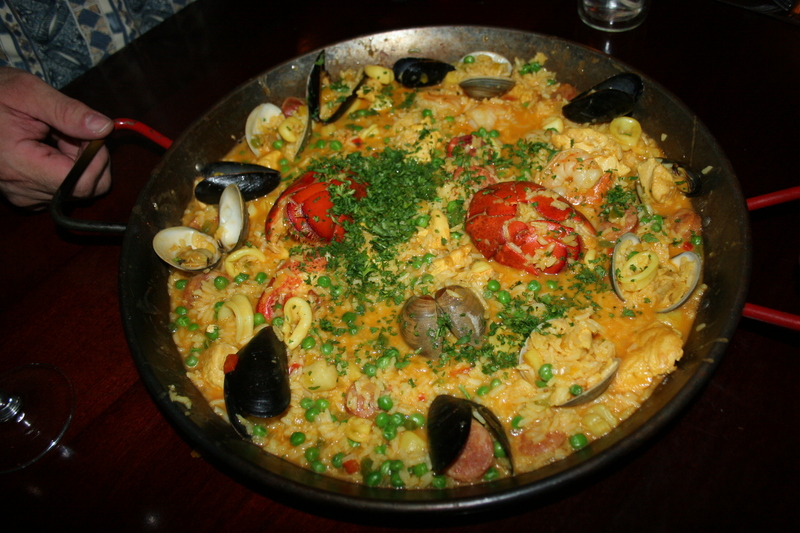 Certainly, part of it is the uniqueness of the spicy Cuban influenced menu. It’s also the enticing wrap-around porch that on a balmy, breezy summer evening can be the perfect setting for a meal. Another part of the draw is the building itself; an imposing Cape May style Victorian that stands alone and seems to serve as a guardian for the many other Collingswood eateries further along Haddon Ave. Some, or all of this, brought us to Casona on a gorgeous Saturday night of Labor Day Weekend. Unfortunately, scores of others had the same idea and we were unable to secure seating at an outside table. We did have the next best thing though, a nice table by the open doorway where the soft breezes were still evident. 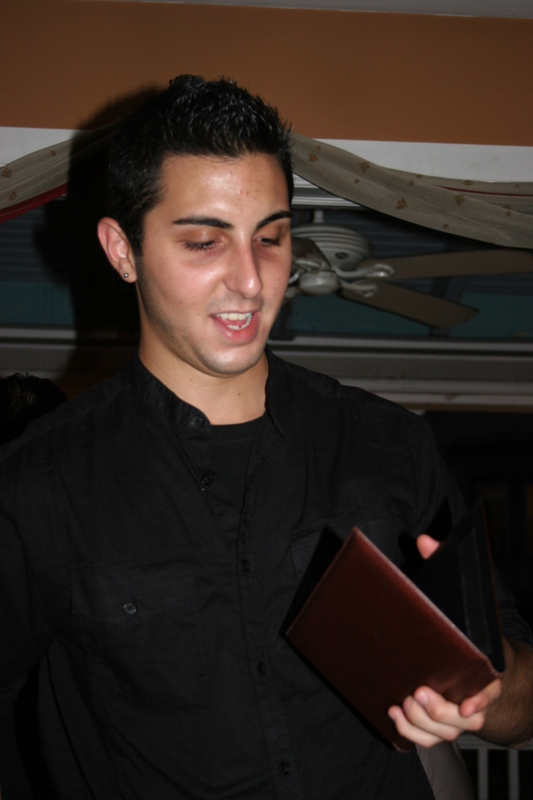 Our server, Ivan, was both personable and enthusiastic. He chatted while opening our wines and told us of the lone special for the evening. The regular menu at Casona is chock full of interesting offerings and I don’t think they really need to have many “specials”. 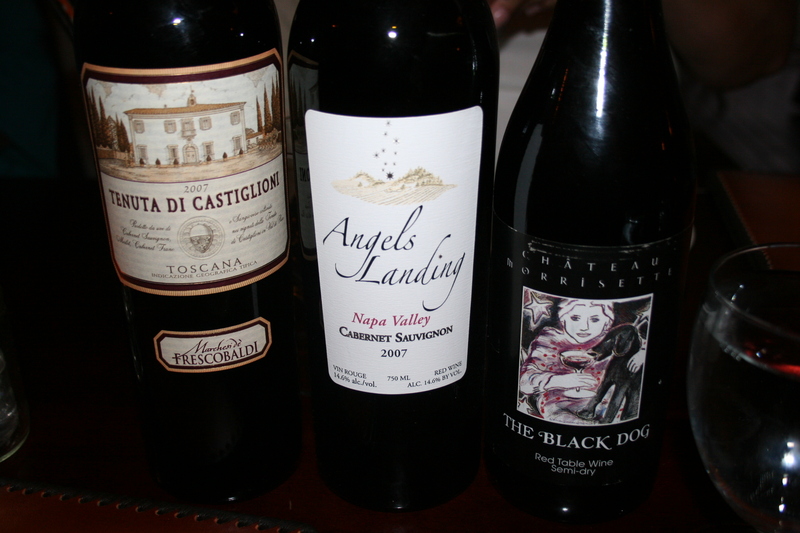 These were the wines that the six of us would share with our spicy food. Joe B. had the 2007 Marchesi De Frescobaldi, Tenuta di Castiglioni, a Super Tuscan. We all liked this wine a lot. It was very food friendly with hints of blackberries and minerals and a velvety finish. It deserves the 93 point rating it received from Wine Spectator. I brought with me one of my wife, Kathy’s favorite wines. The 2007 Angel’s Landing, Stag’s Leap District, Napa Cab. We had this a few months ago at Sonata in Northern Liberties and she had been wanting to try another bottle since then. Everyone seemed to enjoy it and the smooth taste of red and black berries and ripe cherries with a hint of licorice and chocolate make this a tremendous value at under $20.00. Jerry C. always has something a bit unusual and tonight was no different with a 2007 Chateau Morrisette, The Black Dog, Red Blend. If you guessed that Chateau Morrisette was in Bordeaux you’d be off a little as it is located in Floyd, Virginia. The Black Dog is a blend of Cabernet Franc, Merlot and Chambourcin and is light with smooth tannins. 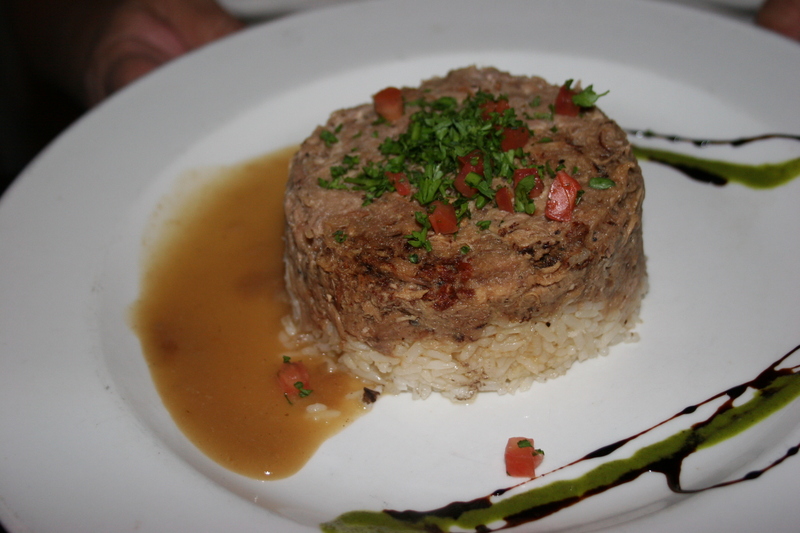 One of the problems with the fare served at Casona is that the spices tend to overpower the wines and if the food wasn’t so good that would be a very big problem. 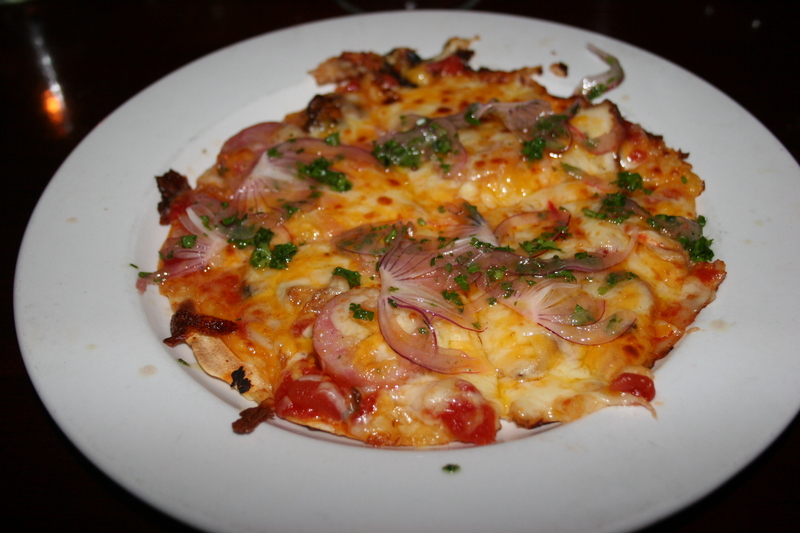 Kathy and I each chose as our appetizer, the Cuban Pizza, – Chicken, Creole tomato sauce, chorizo & cheese 6.95. Kathy thought it was very good, I felt that very good didn’t go far enough in defining just how REALLY good this was. I could have gone with a 2nd one as an entree. The flavors were awesome. Carol wasn’t terribly phased that she had actually ordered Empanados De Pollo because the beef was tasting great. Her dish came with guacamole and sour cream for dipping. 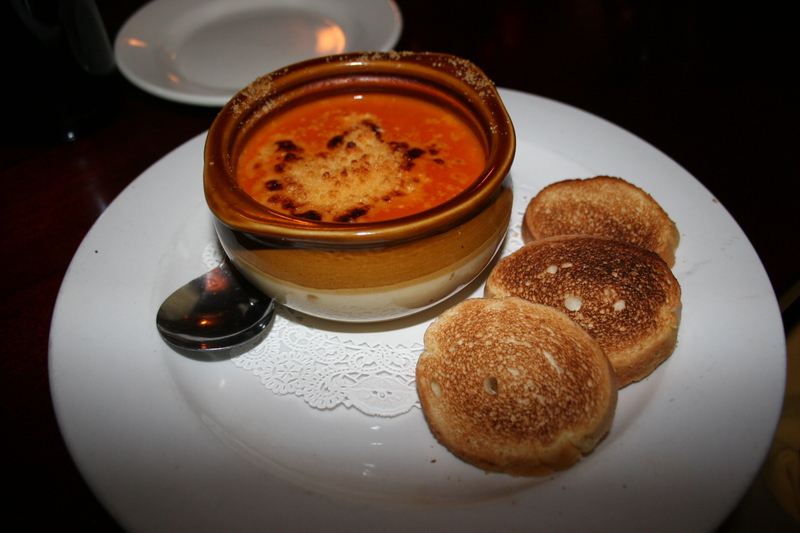 Jerry and Joe were persuaded by Ivan to try the Tomato Soup, served with toasted bread and parmesan cheese $6.50. They both thought it was good but I saw them eyeing our other appetizers and felt they might wait for Ivan outside and end his career as an Appetizer Suggester. Sue C. went with the Pico di Gallo, Tomato, red onion, cilantro, roasted jalapeno, lime juice & olive oil served with corn tortillas or mariquita $5.95. I didn’t take a picture because it was only chips and salza but the salza was spicy hot and required keeping your water glass within reach. Speaking of which, not to nitpick but, with food as spicy as that served at Casona, it becomes very important that the servers and busboys keep an eye on water glasses. On this night, they were not attentive to this chore. On a previous visit we were told that there would be a $1.00 charge for additional chips. They have since, thankfully, done away with this infuriating charge. I think I had ordered this on our last visit. I didn’t hear any complaints on this choice but, by the same token, I did not hear either of them gushing ecstatic over their choice. 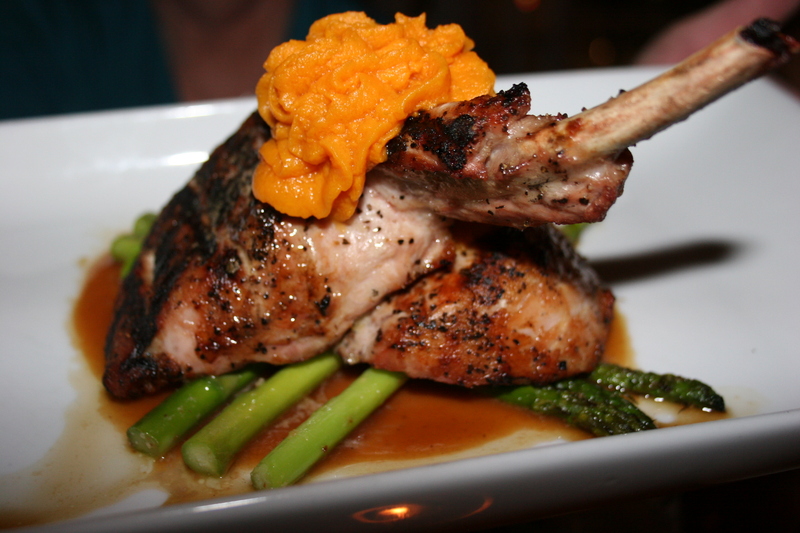 guava sauce & asparagus 21.50. Her chop was nicely done and she enjoyed her dish. It looked like a very nice presentation; colorful and appealing. They both worked diligently at the huge dish and did their best to finish as much as they could. They still had some to take home. Joe put a little on my bread dish and I think I shared their view that, although it was good, it could have been better with an addition of flavor. 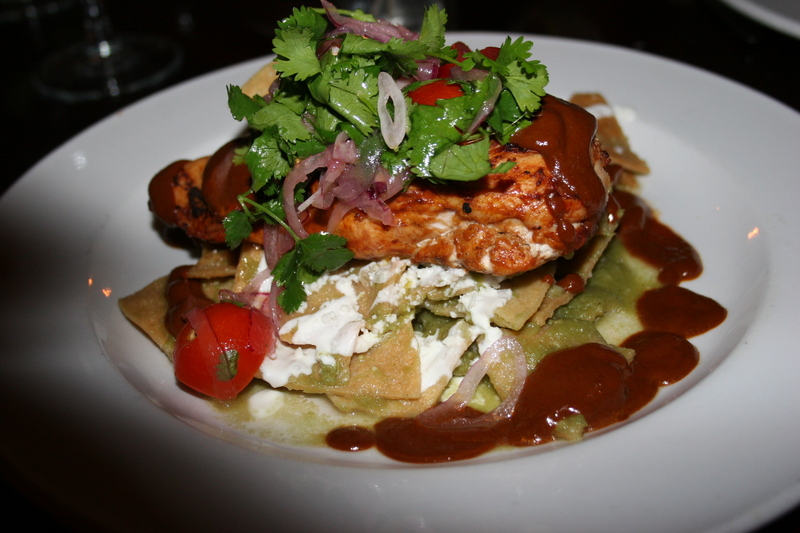 For as many things in the entree, it was lacking in bright flavors and slightly bland. 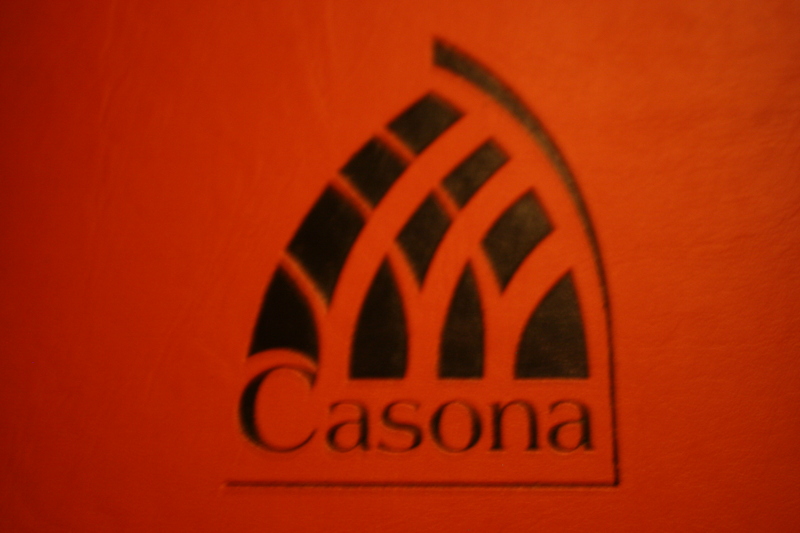 Overall, it was a nice experience at Casona. A beautiful night, good wines, good food, good conversation in a nice setting. Nothing wrong with that.